NAVADHANYA has not introduced by anybody from his/her own experiences and knowledge. It has evolved, by following the climatic conditions; district farmers were cultivated dryland agriculture in the district. With the erratic rainfall every year the farmers are facing drought in the district. Even though in erratic rainfall also the dry land agriculture is sustained in the district during the past. With experiences in their life, the cropping system was evolved as NAVADHANYA a dryland agriculture system in the district. 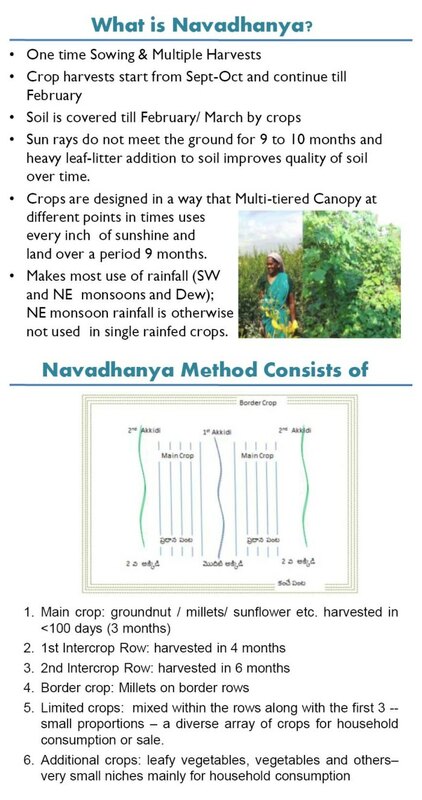 The NAVA DHANYA is an intercropping system in dryland agriculture. It has evolved to sustain crops in erratic rainfall by the farmer’s experiments. And also, it has evolved the system for trapping erratic rainfall and utilizing 100% to the crops. So, the farmers used the system as net of erratic rainfall in drought-prone areas for protecting at least 2/3 of the crops in their fields. The cropping system will keep the land greenery for 10 months in a year. So, the system has evolved by the experiences of drought farmer, in his experimental exercises with the erratic rainfall. With the system of NAVA DHANYA the crops and land will be utilized all the erratic rainfall whenever it occurs in the year. It was evolved for the rescue of hunger deaths in drought-prone areas. The NAVA DHANYA is not an imposed agriculture system and it has evolved by the experiences of drought farmers for their life existing. It is a baby of the drought farmers but, her birth by the necessity of and painfulness of farming community in doughtiness. Slowly, it has grown step by step and became as a perfect dry land sustainable Agriculture system in the area. Culturally, it has mingled as part of the farming community, had been celebrating the event in the name of MOLAKALA POURNAMI (Seed sprouting festival) and it will be celebrating in every year before sowing season that is the month of May. The NAVA DHANYA is a combination of 3 types of crops that, millets, pulses and oil crops. In millets we having two categories; small millets 1.faxtail, sama(Little Millets), arika(Kodo millet), ragi(Finger millet), Udalu(Barnyard Millet) and big millets Bajra(Pearl Millet) and Jowar(Sorghum). The millets will be main crops and pulses and oil crops will be intercrop combination. The small millets will be growing up to 3 to 4 feet and harvested in 3 to 4 months only. And big millets will be growing up to 4 to 5 feet and will be harvested in 4 to 5 months. Through this cropping system, the farmers had been producing the needed food grins for their families as well as fodder for their cattle. So, the NAVA DHANYA is a cropping system for food and fodder producing. Through these crops, they got enough carbohydrates, nutrients and fats for their bodies and the same for their cattle. In NAVA DHANYA the millets had been the main crop and other pulses and oil crops had been intercropping in the system. So, NAVA DHANYA has an excellent diversification in the cropping system for dry land agriculture and it has the only suitable model for drought-prone areas. The NAVADHANYA combination details are given in the table. The cattle will be playing the main role in NAVA DHANYA a system of sustainable dryland agriculture. The crop waste (stems and leaves of the crops) are used as fodder for the cattle then it was transferred as manure for the agriculture land. The farm waste will be used as fodder for cattle and cattle waste will be used as manure for the farm. The same fertility will be continued in between the family, cattle and Agriculture land. So, it has been circulating in between farm to cattle. So, It is called as “POLI” in the traditional agricultural system.